When I ordered the dulce de leche cheesecake, I got more than I bargained for. I almost couldn’t finish it! The cake was thick and fluffy with layers of milky caramel holding the slice together. 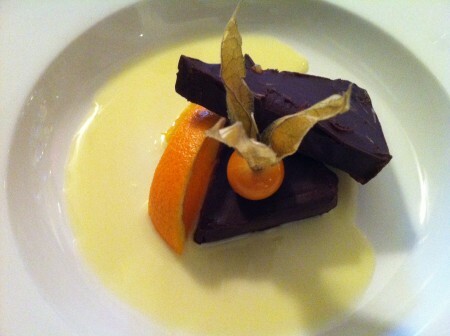 The chocolate terrine was pure chocolate mixed with some berries and garnished with a slice of sugared orange and a groundberry. My friend could hardly finish the first slice and had to take the second home to eat at a later date. Service is reasonably fast, the small terrasse outside is a nice touch, and the location is easy to get to (less than five minutes from Victoria Square Metro Station). Tags: Cheesecake, Chocolate, Dessert, Dinner, Dulce de Leche, Italian, Lunch, McGill, Montreal, Pizzaiolle, Terrine, Vieux-Port. oh my god, that looks incredible… and you went just for dessert! if I’m in the area, I’m definitely gonna check this place out.